The diagnosis of LCH is usually made by performing a biopsy of an affected part of the body. A biopsy is the removal of a small piece of tissue while a patient is under an anaesthetic. This piece of tissue is then examined under a microscope. Doctors will be carrying out a number of further tests. These tests are done to see how LCH affects that part of the body and if any other systems are involved (multi-system disease). This information helps the medical team to decide on the best treatment for you. Some of the following tests may be carried out for LCH. • X-ray pictures of the chest and of the bones (also known as a skeletal survey). • Ultrasound Scan – sound waves are used to build up a picture of the inside of the body. A clear gel is spread over the skin and a microphone is passed over the body. The sound waves bounce off the organs inside the body and are picked up by the microphone. A computer turns the sound waves into pictures. 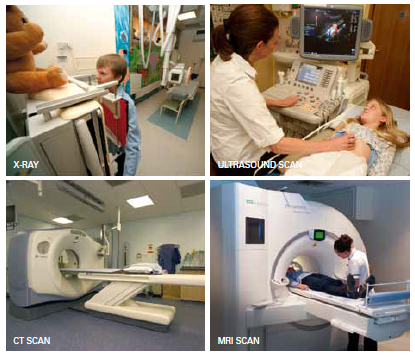 • MRI Scan – Magnetic Resonance Imaging (MRI) Scan uses magnetic and radio waves to take pictures of the body. It is painless, but usually takes longer than a CT scan and is quite noisy. • Biopsy – the removal of a small piece of tissue from an organ or part of the body for microscopic examination. Most often the biopsy is done of affected bone or skin but biopsies may also need to be carried out on the liver, lung or bone marrow. • Water Deprivation Test – if doctors suspect there is a hormone problem known as diabetes insipidus, you may need to undergo a water deprivation test. This is a test to measure how much urine is made and how concentrated it becomes when no water is given to a patient for a certain amount of time (also called fluid deprivation test) To complete all of these tests can take between a few days and a couple of weeks and may involve a stay in hospital. When LCH is described as a ‘single system’ disease, it means that it is only affecting one system in the body – for example, skin, bone or an organ. The majority (>70%) of patients have single system disease. If the LCH is only present in one place in that particular system, it is called single site and if in more than one place, it is called multi-site or multi-focal disease. Therefore a patient with several affected bones, but no disease elsewhere, is considered to have ‘single system, multi-focal’ disease. When LCH is found in more than one ‘system’, for example, in both the skin and bone, it is described as ‘multi-system’ disease. Patients with ‘multisystem’ disease affecting the liver, spleen or bone marrow, are considered to have a more serious form of LCH. This is then described as multi-system disease with ‘risk organ’ involvement and may require more intensive treatment. This classification helps doctors to decide what treatment is required and for how long it should be given.